Have You Registered for NHCMTC yet? New for 2018 ~ the print program is NOW available for download ~ see link below and online registration is open. Please note: We still seek Student & Teacher Showcases, EdTech Playgrounds, and solutions partners for all three days. Please email me at cdunlap55@comcast.net if you have any questions or a solution partner who you would like to see at CMTC! Click here to download the print program. PreConference Workshop information posted by the end of August. Join our internationally renown keynotes . 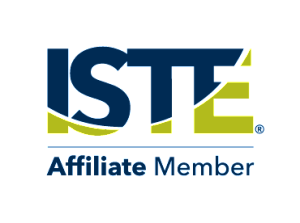 . .
New England ISTE (NEISTE) is hosting some upcoming webinars. Click on the titles of the webinars to register. NHSTE Awards!!! Please Submit a Nomination ASAP! It is time to nominate a colleague for one of our NHSTE Awards. Click here to nominate a colleague. Online registration for CMTC 2018 is now open! Online registration for CMTC 2018 is now open! Sign up early for Master It & Take It (MITI) workshops offered on Monday, 11/26. The deadline for MITI workshop registration is Thursday, November 1st. All MITI workshops are also available as BYOD (Bring Your Own Device). Check out what BYOD devices/resources you need for BYOD workshops on the CMTC 2018 website under ATTEND - PROGRAM - MITI WORKSHOPS. The Teacher Showcase highlights the use of instructional technology tools and resources that engage and empower students to enhance learning. Examples include: demonstrating technology-enhanced projects using online interactive tools, social networking, video libraries, Google tools, or online conferencing to get students excited about and involved in their learning. From 10:00 to 11:30 on Tuesday and Wednesday and 8:50 to 10:20 on Thursday, conference attendees walk around and chat with Teacher Showcase presenters. Each showcase is provided with a new, larger 15’ x 20’ booth and 6’ long skirted table for displaying their materials. The process is comfortable, relaxed, and informative. The Student STEAM Showcase highlights programs across the state engaging students in a variety of STEAM activities in grades K-12. The student showcase takes place in the afternoon from 1:00 to 3:15 (1:00-1:30 setup, 1:30-3:00 showcase, 3:00-3:15 breakdown). We welcome up to two adults with a maximum of five students per team. Each team receives a one-day conference registration for a maximum of two adults. Each student team is provided with a new, larger 15’ x 20’ booth and 6’ long skirted table for displaying their materials. EdTech Playgrounds bring together educators and exhibitors to provide attendees with hands-on fun and engagement in the EXPO Center morning and afternoon. Potential topics include: Digital Age Library, MakerSpaces, Assistive Technology, Technology & the Early Learner, Coding & Robotics, GAFE, Augmented/Virtual Reality, and Video Production. Playground participants receive a round or square table and plenty of space for setting up an interactive environment. Teacher playgrounds run for 2 hours. We look forward to seeing you at the newly renovated Double Tree by Hilton Manchester Downtown (previously the Radisson) in November. Click here for a list of all of the webinars and the link to register. We are very pleased to add FUNecole to our NHSTE discounted program. FUNecole® is a comprehensive digital learning solution for teaching and assessing Computer Science and 21st-Century/SEL skills in elementary education (Grades 1 to 6). (SEL – Social Emotional Learning) Each lesson is fully planned and supported by an end-to-end package of digital instructional contentincluding detailed activity plans, animated videos, student exercises, gamification guides, and formative assessments. In parallel, the digital learning and sharing platform truly enables the 21st century digital classroom with features including student digital portfolios, real-time project assignments and feedback, learning analytics, interactive assessments, performance benchmarking, and customized lesson planning. FUNecole® has an ISTE Seal of Alignment at the Proficiency Level and is endorsed by Cambridge Assessment International Education for ICT Starters qualifications. Here’s their latest school success story to get an idea of the magnitude of results that FUNecole® schools accomplish. The call for proposals for ISTE 2019 in Philadelphia, PA is now open until 9/17/18! The call for proposals for ISTE 2019 in Philadelphia, PA is now open. From ISTE... "We're seeking sessions that demonstrate and inspire educators to develop students' learning, problem-solving, critical-thinking, creativity, communication and collaboration skills. If you've had a lightning-bolt moment that led you to create an innovative edtech lesson or initiative, tell us about it in your proposal." Proposals will be accepted through Sept. 27. There Are Still Spots Available for the Digital Learning Specialist Roundtable (Elementary) - Please Register Now! The second Digital Learning Specialist Roundtable is being hosted by Nicole Cassamassino at Bedford's Peter Woodbury School for elementary school Technology Integration Teachers/Specialists. Part Learning Tour, part EdCamp, and part discussion group, the attendees set the discussion topics for the day and support each other with their challenges. We know that professional development is important for everyone. In many cases, technology integration teachers are solo in their own buildings or districts. This roundtable opportunity is for those technology integration teachers interested in having conversations about particular topics to improve instruction for staff and students in their own district. Topics/discussion will be tailored based on participant attendees thoughts. Time will be built into schedule for a tour of school/staff conversation. Let’s get together to have thoughtful conversations to help move our schools forward. NHSTE is recruiting hosts in locations around the state, for additional roundtables in 2019. If you are interested in hosting a Roundtable event at your school, please contact, Cyndi Dunlap, NHSTE Professional Learning Chair at cdunlap55@comcast.net. Registration is limited to 20 participants, so register before the school year begins to ensure a seat! NHSTE Premium members receive advance notice of this opportunity. Click here to register... there are a few spaces left! 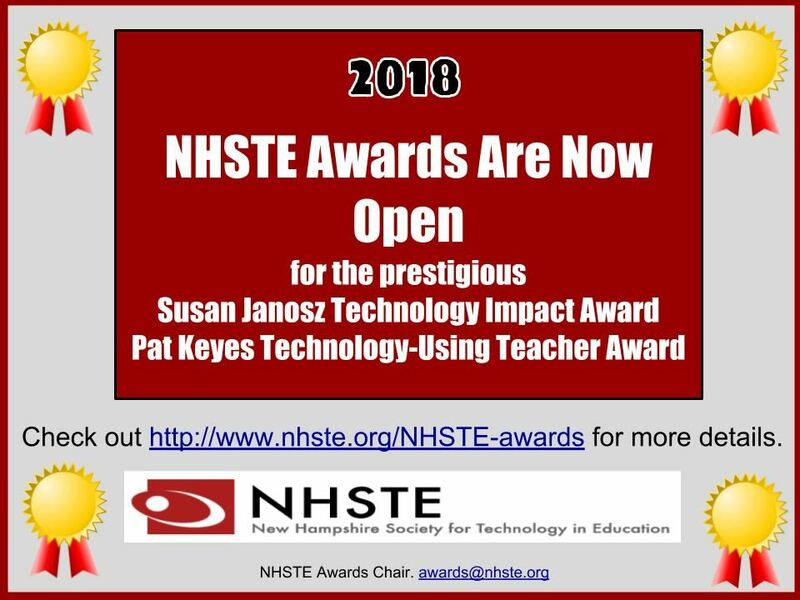 NHSTE has two membership specials available! NEW PREMIUM MEMBERS - Receive a discount (up to $25) to one event (Meetup, Learning Tour, etc.) in your first year of membership. NHSTE's Night of Networking & Annual Meeting: Finding YOUR School's Future Ready Swing! Save the date. Invite a friend! ONLINE Registration is now open!!! Finding YOUR School's Future Ready Swing! Join us at the Derryfield Country Club (625 Mammoth Road, Manchester) on Tuesday, September 25th for an evening of hands-on fun, great food, and casual networking with your colleagues. Bring a friend and plan to meet new like-minded educators. Explore 5 STEAM Playgrounds & Engage in 2 Interactive Conversations this year!!! more STEAM surprises . . .
Start your evening by playing in the STEAM Playgrounds and then continue to explore these interactive spaces during the dinner break. Special guests for the evening include . . .
Sheila Adams, Science Teacher & Robin Ellwood, STEAM Teacher, Rye Jr. HS share this most engaging interdisciplinary effort . . .
During the 2017-18 school year, Rye Junior High School completed a year-long project called “Finding Your Swing”, linked to a school book read of The Boys in the Boat by Daniel James Brown. The term “swing” is used within the competitive rowing community to describe when a rowing crew is in perfect sync with each other and the boat is moving forward at optimum performance. We used the term as a theme for the year to present numerous interdisciplinary challenges to students. One focus of the project was that each grade level (6thgrade - 8th grade) built two rowboats and their corresponding oars. Each grade level constructed a different model boat. At the end of the year, May 31st, RJHS held a “Rye Rowing Regatta” in Rye Harbor at which time grade level teams raced their rowboats through a marked course within the harbor. The entire community was invited to line the shores to cheer on the student performances and accomplishments! Read more about the project in this UNH article. Holly Doe, Director of Technology, Pelham SD, Lia Dossin, Outreach Manager, Future Ready Schools, & Stan Freeda,NHSTE President & NH EdTech Director & Online Learning Specialist facilitate the following conversation . . .
Future Ready Schools® (FRS) is a bold effort to maximize student-centered learning opportunities and help leaders at traditional and charter public schools and private schools leverage technology to prepare students for success in college, a career, and citizenship. Beginning with a systemic planning process, FRS helps district and school leaders develop the human and technological capacity needed to personalize student learning. FRS has a growing collection of FREE research-based planning tools including the FRS Framework, 5 Step Planning Process, and a series of webinars/blogs and resources to support all district’s digital transformation and modernization efforts. Discover all the free support available for New Hampshire districts wanting to develop plans for the effective use of technology in improving learning outcomes using Future Ready tools and resources. Stan Freeda shares his vision for the Future Ready initiative in New Hampshire. Don’t row your boat up stream! Join the Future Ready Schools community for support for every stroke. If you are not already a NHSTE member, it is easy to join and we even have a FREE membership (Basic). Time: 4:00 to 8:00 p.m.
We regret that we cannot offer onsite registration. 4:45 to 5:30 - Sheila & Robin - "Finding your Swing"
*Promotion code will be emailed to these individuals directly. You may pay for your registration using check, purchase order, NHSTE event coupon, VISA, or MasterCard. Become a NHSTE member to keep informed about more events like this. If you are not a NHSTE member join this great group for FREE with a basic membership or a paid (Premium) membership. For more information contact Andrea O'Neil at: oneil.andrea@gmail.com. More information and online registration: N3 ~ NHSTE Night of Networking, Annual Meeting, & Finding YOUR School's Future Ready Swing!